Sending an application for a job opening that does not exist for the time being is a high risk, high reward maneuver. The best person to address your application would be the Human Resources Manager. For sure, he receives hundreds or thousands of job applications each day. His group may be focused only on processing job applications for official company postings. There are Human Resource Managers who upon finding an application that does not conform to the posted job, will just place it in a 201 file. Thus, it is possible that your application may never see the light of day. At the same time, the Human Resources Manager may view your application as a sign of confidence and self-belief. The key is in how you craft the content of your cover letter. In the first paragraph, make it clear that you are aware of the sterling reputation of the company you are applying for. Follow it up immediately on why you decided to send a cold contact cover letter. If you’ve read news reports the company is expanding operations, indicate the facts as you know them and credit the source. HR Personnel appreciate it when the candidate undertakes extra effort to conduct research. It shows determination and commitment to see this endeavor through. In the body, state your qualifications. Give details on your relevant job experiences which are congruent with the company’s business development plans. Indicate any projects or undertakings that are related or could be of great value to the company you are applying to. Share your accomplishments the past 1 to 2 years and the significance of these to the industry. The general idea is to get the attention of the recipient; to open his eyes and make him think he may have stumbled upon a great addition to the company. 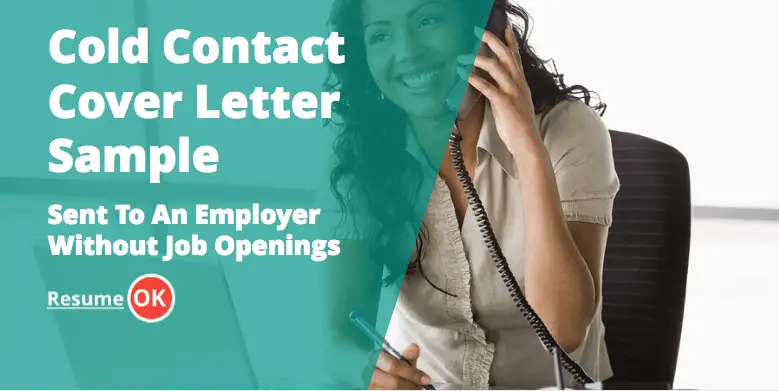 Sending a cold contact cover letter is a risky proposition because you are trying to create a need where there is none, at least for the moment. It takes guts to go through with this approach. HR Managers may take this against you or in favor of you. Either way, your cover letter should sustain the same level of grit and determination. In your conclusion, it is very important to maintain a sense of optimism. This sends the message to the recipient that you respect his opinion but are certain he understands your purpose. Reiterate your confidence in your experience and potential contribution to their company. ABC Management Consultants is widely regarded as the best property development firm in the country. Your reputation in providing top notch services in property evaluation and research remains unparalleled in the industry. I read in yesterday’s edition of The Daily Telegraph that your company is planning to expand operations in an effort to accommodate the increasing demand for property in Sydney, Melbourne, Brisbane and Parramatta. Thus, I decided to use the moment as an opportunity to present my services to ABC Management Consultants. In the last two years, I was involved in projects which spearheaded research work funded by government agencies and by private international banks which focused on the property sector of Australia. There had been growing interest in overseeing the growth and market expansion patterns of Australia particularly in the cities of Sydney and Melbourne because the increase in property values have not been congruent with the weakening of the Australian Dollar and other currencies vis-à-vis the United States Dollar. I have done studies that seek to uncover the relationships between currency fluctuations, interest rate movements and consumer behavioral patterns in light of these property increases. I believe my expertise and experience in the real estate property sector shall provide valuable assistance to your company’s endeavors over the next few years. I am hopeful that my curriculum vitae and portfolio of work shall merit enough consideration to warrant further opportunity to explore the possibility of working with your organization.